We adopted Finn (formerly puppy “Moe”) last September. He just had his first birthday! We wanted to send in an update and a new photo. Finn has been a busy boy over the past year! He’s grown to an amazing 65 pounds, and is so tall, we think he might be part horse! He’s finally figured out how to use those lanky legs though (thank goodness, no more boosting him into the car!) and boy, is he FAST!! He’s also quite amazing with other dogs. Since we adopted him, he’s helped countless foster dogs find their “inner Boxer.” We’ve had dogs come in that had no idea what toys were, how to play with other dogs, what a crate was…and Finn would help each one of them adjust to life with a family. We even had a Boxer earlier this year who was left for dead – she was found with a severe case of demodex mange, bloody, lifeless, and all bones. Her first day with us, she barely raised her head off the blanket. We soon realized she was also deaf! It was obvious she had never been around other dogs, but Finn was patient. As she healed, he offered her toys, play bows, submitted to her growls and waited for her to come out of her shell. And it WORKED! Within a month, our foster (who was known as Miss Priss) was playing tug-o-war with Finn, grabbing toys out of the toy box, and running the back yard like she had never known another life. The amazing thing is that I could tell this story over and over. Finn is magical. All of our foster dogs know it, and we know it too! Unfortunately, Finn has had some health issues that slowed him down (two surgeries for tumors – both benign, thankfully!! ), but he’s fully recovered and back to work. In the past few months, we’ve continued his training towards his CGC. He’s got a beautiful loose leash walk, a 50-yard recall, and he learns new commands in a snap. He’s so calm and laid back, yet breaks out that Boxer silliness when he senses it’s needed! He’s the perfect balance of couch potato and clown. As we celebrate Finn’s first birthday (est. 7/31), we reflect on the last year, and feel so thankful and fortunate to have him in our life. Austin Boxer Rescue made that possible. They work so hard to save as many Boxers as possible, and not just in Austin, but throughout the entire Central Texas area. They bring in dogs from as far north as the Panhandle to as far South as the Border. I am a proud volunteer, and can say first hand that this is an exceptional group of people! Even with limited resources and foster homes, they make it work. 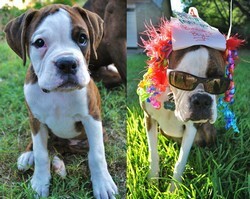 The number of Boxers saved grows every year! And as a foster parent, I have witnessed so many amazing transformations within these dogs – they come in terrified, confused, and often underweight and infested with parasites. Yet, thanks to the hard work of our volunteers, they recover! They thrive – gain weight, get healthy, get spoiled! They learn to love and trust humans again, learn to be part of a family. And best of all, they are safe and loved until they find forever families! Thank you ABR – you all rock our socks off! Erin, proud mama to skin kids Kiahna and Phoenix, and fur babies Jake, Finn, Noble and ABR foster baby (currently Otis! ).